• Connector symbols shown from the terminal side are enclosed by a single line and followed by the direction mark. 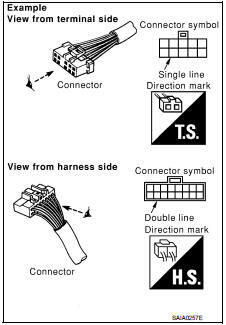 • Connector symbols shown from the harness side are enclosed by a double line and followed by the direction mark. • Certain systems and components, especially those related to OBD, may use a new style slide-locking type harness connector. For description and how to disconnect, refer to PG section, “Description”, “HARNESS CONNECTOR”. • Male and female terminals Connector guides for male terminals are shown in black and female terminals in white in wiring diagrams.